Pope Francis has released his message for the 25th World Day of the Sick to take place on 11 February 2017, the commemoration of Our Lady of Lourdes. The Day of the Sick was instituted by Pope Saint John Paul II in 1992, who called it "a special time of prayer and sharing, of offering one's suffering". 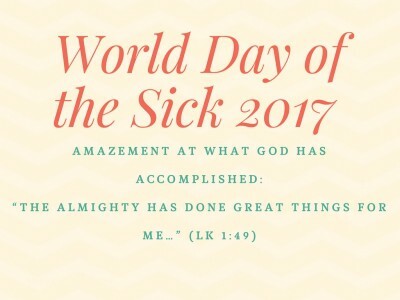 Pope Francis entitled his message for the 2017 celebration of the World Day of the Sick "Amazement at what God has accomplished: 'The Almighty has done great things for me…' (Lk 1:49)". He said the commemoration "gives the Church renewed spiritual energy for carrying out ever more fully that fundamental part of her mission which includes serving the poor, the infirm, the suffering, the outcast, and the marginalized." The Pope also expressed his "closeness to all of you, our suffering brothers and sisters, and to your families, as well as my appreciation for all those in different roles of service and in healthcare institutions throughout the world who work with professionalism, responsibility, and dedication for your care, treatment and daily well-being." He said all the infirm and those who help them should look to Mary, "Health of the Infirm, the sure sign of God's love for every human being and a model of surrender to his will." Mary's apparition at Lourdes to the "poor, illiterate, and ill" Bernadette, he said, reminds us "that every person is, and always remains, a human being, and is to be treated as such. The sick and the those who are disabled, even severely, have their own inalienable dignity and mission in life." In his message, the Holy Father said God's solicitude for "the world of suffering and sickness" is revealed in Jesus. "The solidarity shown by Christ, the Son of God born of Mary, is the expression of God's merciful omnipotence, which is made manifest in our life – above all when that life is frail, pain-filled, humbled, marginalized, and suffering – and fills it with the power of hope that can sustain us and enable us to get up again." He said the celebration of the World Day of the Sick should provide "new incentive to work for the growth of a culture of respect for life, health and the environment" and "inspire renewed efforts to defend the integrity and dignity of persons, not least through a correct approach to bioethical issues, the protection of the vulnerable and the protection of the environment." Finally, Pope Francis invited the sick, healthcare workers, and volunteers to turn to Mary in prayer. He said, "May her maternal intercession sustain and accompany our faith, and obtain for us from Christ her Son hope along our journey of healing and of health, a sense of fraternity and responsibility, a commitment to integral human development, and the joy of feeling gratitude whenever God amazes us by his fidelity and his mercy."